Protein is good. Protein is important! A proper paleo diet is a moderate to high protein diet. But women often struggle to get enough protein, even paleo women. There are various reasons for why this is, but I’m not terribly interested in those today. What I am interested in is telling you about a new product that can get more protein into your diet (in a tasty and delicious way!) and also might save the planet. Many countries rely on this interesting source of protein. In fact, it is a major portion of protein in the diets of many. It is easy to cultivate and easier on the environment. So what IS this type of protein??? My friends at Exo, a fabulous company at the heart of creating paleo protein products made from crickets, sent me a sampler set of their protein bars which use cricket protein (from a cricket flour) as the main ingredient. I have personally tried EVERY flavor of these bars. I have inspected them for cricket parts and cricket taste. I EXPECTED to be grossed out and I found the total opposite. Raising crickets takes less feed (and that’s per pound of product! ), produces 100x less greenhouse gasses than producing meat, and requires vastly less water than what beef, pork, or even chicken require. Crickets also contain more iron than spinach and are a COMPLETE protein containing all the essential amino acids one needs (something not true of many plant proteins). Those are pretty amazing things, especially if you care about the environment! The texture of Exo bars is smooth, similar to how I remember fig newtons tasting! They have a very nice “mouth feel” as the foodies say. There are no tiny cricket legs or eyes looking up at you! Everything is ground down into a smooth flour so that if you are having trouble with the idea of eating crickets, you can pretend you aren’t doing that! Banana bread (Umm yes) Find it here. Apple Cinnamon (Halleluj) Find it here. Blueberry Vanilla (Breakfast Heaven) Find it here. Cocoa Nut (Dessert!) Find it here. And a personal favorite, if just for the nostalgia, Peanut Butter and Jelly! Find it here. If you’re interested in trying these for yourself, you can buy your favorite flavors alone or get one of the yummy sampler packs! Here’s where to find the 4 flavor sampler pack which comes with 12 delicious protein bars. These bars make a fantastic meal replacement for when you are in a hurry. Because of the nice high protein content they are a MUCH better choice than many bars, including many paleo bars that are basically almonds dipped in honey. These will provide lasting energy and satiety, keeping you full until the next meal. I also like them as a post-workout (or post-dance!) snack. Overall, I have nothing but lovely things to say about Exo and their fabulous protein bars. I highly encourage you to try them out. Just give them a chance. I can almost guarantee you’ll love them! And to find out more about Exo and why cricket protein is the future check out their website at www.exoprotein.com Use the code PALEOFORWOMEN for 15% off your order! I’m so interested in trying cricket flour in both bars and baking! I’ll check these out! I love these bars. I always gave one with me in case i need food. I probably eat 1 or 2 every week. I buy them thru Thrive market. I did chicolate first and they were crumblier. But the apple is amazing! I have had two boxes of those now, but i think next i will do the blueberry. They taste delicious, which people akways say about a lot og gross tasting protien bsts. But these are delicious and satsfying. I am interested in sampling the Exo bars but have a question for you regarding the ingredients. They contain flaxseed and on one of your podcast recordings you indicate flaxseeds as a food to avoid. After listening to the podcast I threw all my flaxseed away! I am now confused about buying these bars? What is your take on the fact that they contain flaxseeds? Thanks for all your awesome wisdom via the podcast! I was hesitant to try these at first, but they are delicious. Very lara bar esque, and a great way to get some added protein in. I think it would be great to start integrating cricket flour into baking, but I’m not adventurous enough to jump in and figure out recipes myself. I’ve tried the banana bread and the pb&j… I definitely would like to try the other flavors, but I think I would go banana bread all the way! Sounds very interesting. I currently use Quest bars, so I would like to compare the taste! I am very interested in trying cricket protein bars! Sounds like a good meal replacement product! The peanut butter & jelly sounds delish!! This is pretty fascinating to me. Blueberry vanilla definitely sounds like an awesome breakfast option. Breakfast is a tough one for me sometimes because I hear so many different things about what is and isn’t healthy/ideal to eat for breakfast. Crickets and rabbits! The protein of the future!! (My friends and I had a huge running joke about this in college…not sure why we thought it was so funny. Anyway, I would love to try it, especially the Apple cinnamon. Growing up I had pet geckos…they loved their crickets…should have made my own cricket flour HAHA! I’ve tried these once before and I’d love to try more flavors! I’m always on the hunt for a good protein bar. I was just thinking about giving these a try! Everything about these sounds fantastic, I just hope they taste great!! I’ve tried two flavors and have loved them! I really want to try the banana flavor! They don’t taste like cricket at all! I’ve read about cricket flour but have never been brave enough to try. I’d love to try out these bars though! All flavors sound delicious – especially banana bread! I would love to try these cricket protein bars! My high school biology teacher fed us chocolate chip cricket cookies in class, and they were as crunchy and delicious as I never imagined them to be. I am thrilled that the market is including crickets for the reasons you stated (environmentally friendly). I really want to try these bars, but as a working college student, I am afraid they are not quite in my budget yet. Please consider me for this gift! The coco nut, because, duh, chocolate! What about the Sugar content in the exo bars? Do think that is high? ooooh excited to try banana bread! I’ve been wanting to try cricket flour!! All the flavors sound amazing… maybe I would like to try blueberry vanilla. I’ve been wanting to try these for so long! But i haven’t been able to find them in a store near me (hard to swallow buying a whole box online without knowing that I’ll like them). I love the concept of crickets as food, and I hope it will become more common in the U.S.! Oh my gosh yessssss!! I’ve been dying to try these! I’ve seen a bunch of bloggers talking about them all of a sudden, and am super curious!! Crickets, huh?!?! Sounds very interesting and intriguing. I’d like to try the cocoa nut or apple cinnamon! I would love to try cricket protein because I’m always trying to find a tasty way to get protein in and there’s only so much meat I can eat. I would love to try the coconut or blueberry vanilla because I have a serious sweet tooth. I’ve never tried cricket flour and amazed at the amount of protein that comes from bugs! I would most definitely love to try these bars! They all sound delish but I’d have to go with Blueberry or Apple! Thank you! I’d love to try these. Coco nut of course!!!! Would love to try these!!! Have yet to have the chance though. I have been looking for a new protein bar because there really isn’t a good one out three thats paleo but also has a decent amount of protein and not too much sugar. I really want to try the Apple and Cocoa Nut! Thank Steph! I saw these for sale on another site but was unsure about them. After reading this I definitely want to give them a try!! Blueberry Vanilla and PB&J sound delish!! Peanut Butter and Jelly! – But it still sounds yucky – If I could get it for free, I might try it though! I once made chocolate covered crickets for my participation in goverment class. We didbweekly current events presentations. I clipped an article about a zoo hosting an insect tasting. I am always looking for ways to balance the carbohydrates in my diet with protein. I tried one of these a few years ago right around when they first came out and I really liked it! I never got around to buying them though because of the high sugar content- now that I’ve actually looked at the ingredients I’m realizing how much I’ve missed out on because most of the sugar looks to be from actual fruit! Anyway, I’d love to give them another shot, especially the banana bread flavor. As a conscious omnivore, I love how environmentally-friendly they are. Hi! I am definitely game to try out these cricket flour protein bars! My teen kids will enjoy trying them too. Blueberry Vanilla and Cocoa Nut sound especially yummy. Thanks! I’ve been wanting to try these for a long time! Blueberry vanilla is right up my alley and since reintroducing meat back into my diet a couple years ago, I’m down to try all kinds of protein…even bugs!!! I’ve been wanting to try cricket flour for awhile now. These look tasty, especially the banana bread one. I would LOVE to try these, I’m always on the lookout for high quality protein bars as I’m a busy mom! And, of course guilt free sweets are a must, so the coco nut flavor would be the one I would try first. I’d love to try the banana bread flavor! I’ve been wanting to try these for a while– the problem is they’re a little out of my price range! Would love to win this! Oh my goodness, I have been wanting to try cricket protein for SO long! These sound delicious! Thanks for enlightening us on these bars, ladies! I’m super excited to try these! I’ve read before how insects as a protein source can be a more environmentally friendly option, and cricket flour sounds intriguing. I’m gonna go with PBJ as the flavor I’d like to taste first… Yum! I would love to try cricket protein because of all the good things I’ve heard and I am always looking for healthy convenient ways to get protein as my body doesn’t really tolerate whey and other common protein bar ingredients. I’d love some blueberry vanilla because that just sounds MAGICAL. Thanks for sharing! I’ve been wanting to try exo bars!! Especially cocoa nut! I’ve been looking for them but haven’t seen them at any stores near me. The idea of eating crickets is kind of intriguing! Hi Stephanie! I would like to try these because most of the protein bars I see are full of unhealthy ingredients and things that I’m allergic to, so these are perfect for me! I’m an Equal Opportunity Animal Eater, so trying cricket flour is right up my alley! The flavor I would most like to taste is cocoa nut. Thank you! Would love to try the Cocoa Nut (duh, chocolate!) and Apple Cinnamon. I bought cricket flour a while ago but haven’t yet taken the plunge to bake with it. Have you tried baking anything with the flour? 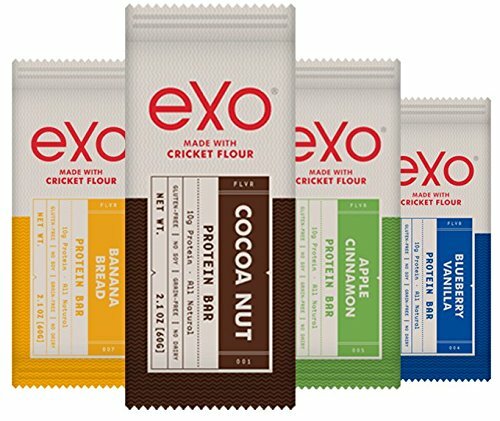 I’ve tried cricket cookies (not great) and a few cricket bars (ok), but I haven’t tried Exo yet. Interested! Would love any tips on baking with it or recipes you’ve tried. I’ve only tried three flavors, and blueberry is my favorite of those. I can’t wait to try banana! I’ve recommended these to clients and havent even tried em myself (yikes!). Would love to try all of them but in particular the apple cinnamon first. certainly seems crazy to say “yum” and “crickets” in the same post so make me a believer!! The idea of eating bugs still weirds me out because of the texture and the crunch and everything. But bug flour is much more manageable. I would definitely give these a go! The coco nut sounds awesome and like a good place to start when eating bugs. I am curious about cricket flour. I will be honest that the thought of it creeps me out a little, but I would LOVE to try the Cocoa Nut to see what it’s all about! I am pretty new to Paleo and am looking for ideas and advice! These bars are one facet of what I’m definitely looking for. The blueberry vanilla bars are more of my speed. I enjoy reading everyone’s advice and look forward to my lifestyle as Paleo! I have never heard of cricket flour! It sounds very interesting. I can’t make up my mind between cocoa nut or banana bread!! As a graduate student and intern studying to become a future dietitian, I am busy, broke, and in need of quality protein! I have been dying to try these bars–finding a protein bar that doesn’t make me cringe when I read the ingredients list has been challenging to say the least. Thank thank thank you for providing a giveaway opportunity, Stefani! I’ve been looking for a cricket bar that isn’t just crickets wrapped in sugar! I want try them all! How interesting! Sounds like a wonderful post-workout meal to get me through the workday until lunch. Blueberry Vanilla sounds beautiful! I would really want to try cricket protein, seeing as how some Asian countries actually do eat them as a source of protein. Also, I’m always a chocolate girl so I NEED to try the cocoa nut! I’ve heard of crickets being a great source of protein, but never imagined a protein bar using them as their main ingredient. I think it’s incredible and definitely want to try this product out! I’ve been looking for a way to add more protein and iron into my diet and this seems like a wonderful solution, especially with my on the go lifestyle. The banana bread and blueberry vanilla sound delicious. Thanks for sharing this product with us Stefani! I would love to try cricket protein! Always interested in future food 🙂 I can totally imagine it to be a great source for our rising protein consumption. I would not object to trying the cricket protein! It’s just way out of my price range, I can barely afford to feed myself what I eat now! All the flavors sound delicious, particularly the banana and blueberry flavors! I’d like to try the chocolate. As far as cricket flour….if I win I’ll decide then. I have yet to try the cricket flour, but I suppose it’s time! I would love to try any of them especially the blueberry vanilla! I am one of those girls that just can’t seem to get enough protein! Will I win points if I actually ate whole dried crickets as a kid? My parents quickly made me into ‘that weird kid in denim jumpers’ during play dates. But I have to argue that they are definitely best if you stir-fry them in spices. That or you make MUFFINS. There are some killah recipes out there (not sure if you’ve found any yet Stef). And one of which that I particularly am in love with, is Apple Cinnamon. Definitely would be down to try the Exo Apple-Cinna bar because of this. Had lots of cricket stuff in Thailand. Fantastic source of protein. Had it in lots of savory dishes but have not tried it sweet. Cocoa would be great I think. I love the idea of getting more protein from crickets! I have actually eaten whole roasted crickets before and they tasted like little protein-packed potato chips! After watching the movie “Cowspiracy” I have definitely been more conscious about the amount of animal products I am consuming and how that consumption is affecting the world now and in the future; therefore, cricket protein seems like a fantastic alternative/addition to our diets! I’d love to try the Apple Cinnamon, because I think I am a cinnamon addict! haha I would also love to try one of their savory flavors, in particular, the Mango Curry. Never tried cricket before? But am sure excited to try it. All flavors sound great, but the banana bread one sounds pretty yummy! Cocoa nut cricket bars?! Yum! I love the use of cricket flour! I love what this company is doing to bring something so sustainable into the mainstream and make it accessible for everyone! I’d love to try the blueberry vanilla!!! I am really impressed by the information shared in this post! I am nervous but very excited to try cricket flour products! Who would have guessed crickets would be so nutricious?? I think the cocoa nut flavor sounds good! They look interesting. I’m always going to try something new! Thanks for all your hard work. I love reading and listening to you! I guess to most people, “cricket flour” would create an instant gag reflex. I won’t lie, it did for me. But if you think about it, this is the true definition of paleo. I’m sure our ancestors made full use of the expansive amounts of protein and amino acids found in insects. Having gotten over the instant “that’s gross” reflex I got when I thought about eating insects, a reflex that no doubt was shaped by our modern day culture, I would LOVE to try cricket flour. The cocoa oats flavor sounds especially delicious! Hi! I am so interested to see what they taste like as I remember eating those little crispy BBQ flavored crickets from the Museum of Science and Industry gift shop as a kid haha! Thank you so much for posting more information about these amazing sounding bars! I am thinking of buying the sampler packs, but the coupon code doesn’t work for me. The idea of eating crickets kinda freaks me out a bit, but I’d definitely try these out. The cocoa nut would be the one I’d go for. This is so cool! All the flavors sound amazing, but I think I am most excited for PB & J and Cocoa Nut! I love thinking about how all sorts of different creatures make me who I am, and vice versa. I am made of so many things! Love crickets, so much I would love to eat them. Slightly skeptical but they seem worth a shot. You can never go wrong with PB&J! I’ve tried the Cacao Nut, Blueberry Vanilla, and Banana Bread. I liked them all, but my favorite was Banana Bread. Would love to try the Apple Cinnamon! Cricket flour?? BRING IT ON. I am woman, I am strong, I can do this. Which flavor?? Peanut butter and jelly. DUH. That’s my childhood… and teenage years 😉 Hope to get a chance to try these! I’d really like to try them all, but given a choice I’d go for the peanut butter one first, the blueberry one second. I think eating bugs is great, and that I’d love to have a variety of choices about how to do so. I can imagine using cricket flour as a gravy enhancer and thickener….I don’t know, but surely there is a lot of potential. Like the meal worm kickstarter thing I saw through some paleo-type blog (except that it was too pricey for me to deal with right now).